Damage is a broad term that refers to anything that lowers the health of the player, an NPC, and/or a creature. Environmental Damage refers to damage caused by the environment, such as falling and drowning. The Cushioned Heavy Armor perk reduces falling damage by half. The internal height units are 64 per yard. The second story of a house is about 4 yards up. 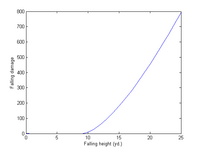 The graph shows falling damage (without the perk) by height in yards. A fall of up to about 9 yards will not hurt you; however, the range of heights from which falling will hurt but not kill you is fairly narrow. In general, falling more than three stories is potentially fatal. Falling damage can be avoided by landing in moderately deep water, by using the Become Ethereal shout before falling, or by being paralyzed on impact (most easily achieved by eating Netch JellyDB). Therefore, using Unrelenting Force and other attacks that may push enemies off a significant height can be an effective method of attack. If you remain submerged in water for 20 seconds you will begin taking damage at a rate of about 20 damage per second until you surface again for air. This can be avoided by using a potion or enchanted item with the Waterbreathing effect. NPCs cannot drown, even if they remain submerged for long enough that they should. While adventuring, you will likely encounter a variety of traps and other hazards that can inflict minor or more severe amounts of damage. A detailed list of traps in Skyrim can be found on this page. Combat damage refers to damage caused directly by either the player, an NPC, or creature. While there are a number of methods for inflicting damage through combat, there are certain things not governed by skills or magical effects that can alter the amount of damage dealt. Power attacks can be used to deal extra damage or be more effective against an opponent who is blocking. They are performed by holding down, instead of tapping, the attack button. A power attack has a chance of staggering its target and consumes Stamina according to the following formula. The amount of Stamina available when you execute a power attack and the amount of Stamina consumed by the attack do not influence how much damage is dealt. However, if you do not have enough stamina to perform a power attack, the stamina bar will flash green and you will perform a regular attack instead. You can perform several kinds of power attacks depending on which movement control you press as you attack and what weapon you are using. If you push the forward input while performing a power attack, you will execute a dash strike, useful to close distance quickly. Moving backwards will cause you to step back and then strike, useful for avoiding and countering enemy attacks. Left and right inputs can be used to sidestep enemy attacks, and with the Sweep perk, a left or right power attack can strike all enemies in a forward arc when using a two-handed weapon. If you are dual wielding, holding down both the left and right attack buttons at the same time results in fast, a three-hit power attack that attacks with both weapons. If you are using only your fists, you will perform a similar three punch strike when the same input is used. Both of these attacks count as three separate power attacks and will consume Stamina accordingly. A critical strike provides extra damage which bypasses armor upon a successful blow. All weapons except staves or "other" weapons (such as forks) can strike a critical with the right perks. Sneak attacks and critical strikes are counted separately. A critical strike is calculated from the critical damage of a weapon; generally speaking, this is the floor of half the weapon's base damage, but the value is set independently in the weapon's data, so exceptions exist. The weapons page lists each weapon's base damage value. Smithing, skill points, enchantments, and power attacks do not modify the extra damage dealt; neither does an Archery weapon's Ammunition. A sprinting power attack with the Critical Charge or Great Critical Charge perk performs a regular power attack + a double critical strike. A double critical strike inflicts twice the amount of extra damage that a critical strike with a two-handed sword with Deep Wounds Rank 1 or a one-handed sword with Bladesman Rank 1 inflicts. Assuming the weapon's base damage is an even number and its critical damage has been set according to the standard trend, a weapon effectively gets its base damage as extra damage when it scores a double critical strike. A two-handed weapon with a base damage of 20 and its critical damage set to 10 as a result, following the standard formula, does 10 extra points of damage with 1 rank of Deep Wounds, 12.5 with 2, 18.75 with 3, and 20 when performing a sprinting power attack with Great Critical Charge; on average, this means 1, 1.875, 3.75, and 20 damage per hit, respectively. A weapon following the typical formula with a base damage of 21 would deal the same. There are 5 difficulty settings, accessible from the Journal (Journal > System > Settings > Gameplay): Novice (very easy), Apprentice (easy), Adept (normal), Expert (hard), and Master (very hard). Patch 1.9 adds a sixth difficulty level: Legendary. Easier settings cause enemies to take more damage and for damage dealt to you to be reduced while harder settings cause enemies to take less damage and you take more. The only other effect it has on the game is on the health costs of the Equilibrium spell. You can change the difficulty level at any time, even in the midst of combat. If you are struggling with a certain enemy or group of enemies, it is possible to adjust to an easier setting, kill the enemy, and then return to your previous difficulty. Note that the difficulty level does affect followers and summons in the same way it affects enemies, making them potentially more valuable as you increase the difficulty level. All Extra Damage 1.5 NPCs need sorting into the correct three versions. Extra Damage is an NPC-only perk used by many leveled NPCs in Skyrim. There are multiple versions of the perk under the same name, although they all have the same effect — actor with the perk will inflict more physical [verification needed — It needs testing if magical damage is affected] damage to his target. Some versions of this perk only work when the target being attacked is you, meaning that if you somehow manage to get the perk it won't do anything. Some versions of the perk multiply damage with one-handed weapons and bows by whatever number is in their editorID, but two-handed melee weapons' damage by a lesser number, which is listed in the table below in "two-handed" column. It isn't known whether the other versions of the perk would work. Reduced Damage and Reduce Damage are perks used by some NPCs in Skyrim. There are multiple versions of the perks, some decrease the damage output of the perk owner while others reduce incoming attack damage by multiplying it by some factor smaller than one. This page was last modified on 26 September 2018, at 16:27.